Take 62 Crosstown East to 34th Ave exit. Go north on 34th Ave S. Go east (right) at 54th St. Proceed to the corner of 38th Ave S and e 54th St. St. Herman’s is on the northeast corner of 38th Ave S and E 54th St. Proceed west across the Mendota Bridge onto 62 Crosstown. Take 34th Ave exit. At stop sign off of the exit ramp, bear right onto 34th Ave S and proceed north to E 54th St. Go east (right) on E 54th St. Proceed to the corner of 38th Ave S and E 54th St. St Herman’s is on the northeast corner of 38th Ave S and E 54th St.
Go north on Hwy 55 (from Eagan), and proceed north to Hwy 110. Go west (left) on Hwy 110, across the Mendota Bridge and onto 62 Crosstown West. Take 34th Ave exit. At stop sign off of the exit ramp, bear right onto 34th Ave S and proceed north to E 54th St. Go east (right) at E 54th St. Proceed to the corner of 38th Ave S and E 54th St. St Herman’s is on the northeast corner of 38th Ave S and E 54th St.
Go north on either Hwy 77 or I-35 West (whichever is closer to you) to 62 Crosstown. Proceed east on 62 Crosstown to 34th Ave exit. Go north on 34th Ave S. Go east (right) at 54th St. Proceed to the corner of 38th Ave S and e 54th St. St. Herman’s is on the northeast corner of 38th Ave S and E 54th St.
Take I-35W south to 62 Crosstown. Proceed east on 62 Crosstown to 34th Ave exit. Go north on 34th Ave S. Go east (right) at 54th St. Proceed to the corner of 38th Ave S and e 54th St. St. Herman’s is on the northeast corner of 38th Ave S and E 54th St.
Take I-94 to Snelling Ave exit. Go south on Snelling Ave. Go west (right) onto Ford Parkway. Cross the Ford Parkway Bridge into Minneapolis, where Ford Parkway becomes 46th Ave S. Proceed to Hiawatha Ave and turn left (south) onto Hiawatha. Go west (right) onto E 54th St. Proceed to corner of 38th Ave S and E 54th St. The Church is on the northeast corner. 9:00 AM Church School and Adult Education, 10:00 AM Divine Liturgy. 7:45 PM Compline with Akathist. The parish holds a full observance of the 12 Great Feast Days. For a complete list of upcoming services, please visit the Monthly Calendar on the parish website. or call Fr Paul. 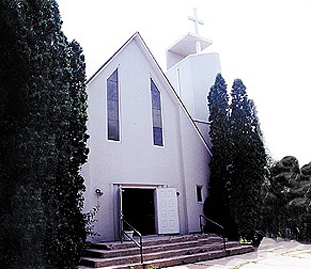 St Herman’s parish was establised as a Mission in 1976 and was granted full parish status in 1999. The parish is composed mostly of “converts” from Lutheran, Episcopal, Nazarene, Roman Catholic, Methodist and New Age backgrounds.